“Back in 1970, when barely half a dozen corporate seedlings had taken root in the fertile ground of Silicon Valley, a company named Signetics bought an idea from an engineer named Hans Camenzind. It wasn’t a breakthrough concept, just 23 transistors and a bunch of resistors that would function as a programmable timer. The timer would be versatile, stable, and simple, but these virtues paled in comparison with its primary selling point. Using the emerging technology of integrated circuits, Signetics could reproduce the whole thing on a silicon chip. This entailed some handiwork. Camenzind spent weeks using a drafting table and a specially mounted X-Acto knife to scribe his circuit into a large plastic sheet. Signetics then reduced this image photographically, etched it into tiny wafers, and embedded each wafer in a half-inch rectangle of black plastic with the product number printed on top. Thus, the 555 timer was born. It turned out to be the most successful chip in history, in both the number of units sold (tens of billions, and counting) and the longevity of its design (unchanged in almost 40 years). The 555 has been used everywhere from toys to spacecraft. It can make lights flash, activate alarm systems, put spaces between beeps, and create the beeps themselves. Today, you can buy a single chip online for about 25 cents. 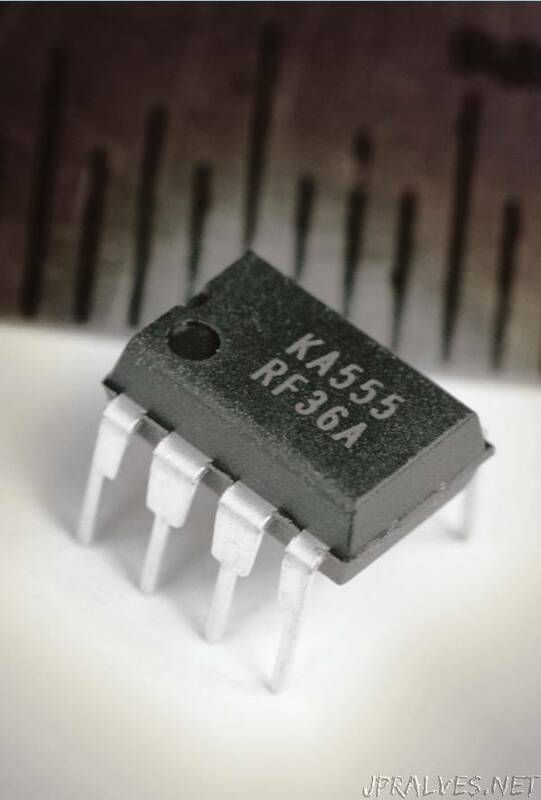 For the introductory project described below, you can use the 555CN, Fairchild LM555CN or KA555, Texas Instruments NE555P, or STMicroelectronics NE555N. The brand makes no difference. Each manufacturer offers a Complimentary Metal-Oxide Semiconductor (CMOS) version, a dual version, and a surface-mount version in addition to the old-style chip that stands on eight metal legs spaced 1/10″ apart. For various reasons, you should use the old-style version.